Rain or shine, we now have an attraction in Pigeon Forge that offers Snow Tubing indoors and all year round! Pigeon Forge Snow is America’s first indoor snow park, the first facility of its kind in the country, with real snow made from ordinary water, just as nature makes it. 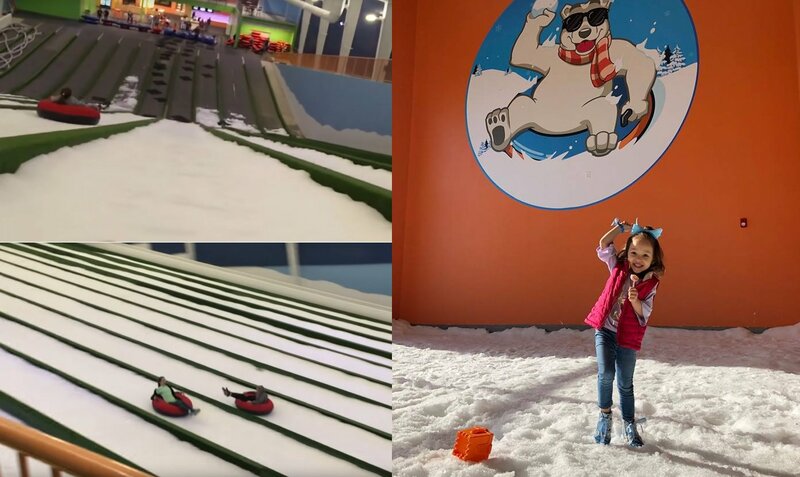 While the air temperature inside is comfortable enough to wear shorts, the indoor slopes are covered in fresh powder, made from advanced technology (similar to the snow guns used at Ober Gatlinburg) – and the kids report that it feels just like sliding down the mountain! Unlike the mountain, however, this run has a conveyor belt so you don’t have to drag your tube back up the hill. This means more time for down-slope runs – you should be able to get a good dozen trips in an hour. There’s also a play area at Pigeon Forge Snow with more of the same fresh snow, so you can build a real snowman or have a snowball fight! Pigeon Forge Snow is a very active experience, useful for giving the kids some fun and wearing them down a little too! It doesn’t require a reservation, so you can drop in anytime. And there’s no entrance fee, so everyone can come in and watch, regardless of who goes tubing. What do you need to know before dropping by? The snow is made out of water, no harsh chemicals or colors to worry about. No reason to break out the heavy winter coats; the building is kept at a comfortable 70 degrees. Minimum age is 3 years old and 36 inches in height. If you get tired of sledding, there’s a separate snow play area with no age restrictions. You can also relax in the viewing area, letting you keep an eye on family members on the hill while you enjoy beverages and snacks.